The National assembly majority leader Aden Duale has broken his silence on the alleged hate speech remarks made by former Nairobi Mayor George Aladwa. Duale who strongly condemned Aladwa's remarks, also cautioned Jubilee leaders saying that the coalition should not entertain such remarks from their leaders as they not only destroy their reputation but make Kenyans to loose their trust towards them. 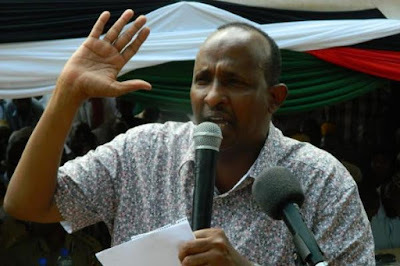 “As we condemn Aladwa let jubilee legislators know that the coalition will disown anyone who makes utterances meant to incite Kenyans into violence,” Duale said. He also urged the Director of Public Prosecution Keriako Tobiko, Director of Criminal Investigation department, and the Inspector General of police force to move with speed and investigate Aladwa's alleged hate speech remarks. Just a day after a video went viral showing the Nairobi ODM chairman George Aladwa making his remarks at a political rally in Kibera, the ODM presidential candidate Raila Odinga came out to defend Duale, saying that he didn't see any problem with the remarks, since they were just cautioning the Jubilee party against rigging the 2017 elections. Aladwa has already recorded a statement at the CID office and released on bond, his case is expected to be heard on Monday 26th.